What is Query XSD Analysis? 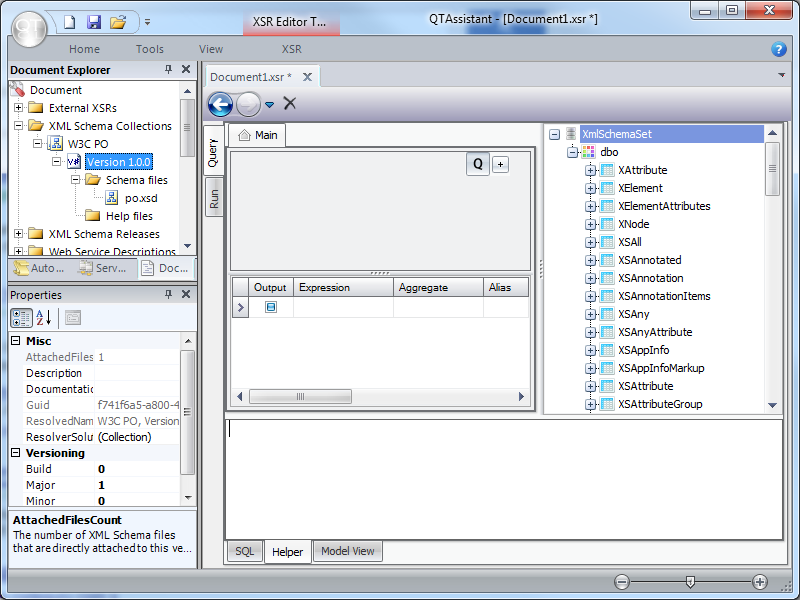 Query XSD Analysis is a set of features that provides the ability to analyse XML Schemas (XSD) files using common query languages. Typical analysis tasks include checking for conformance to naming conventions, use of anonymous types, elements and attributes, namespaces, spell checking, organizational patterns and detection and analysis of class hierarchies. Generated reports are typically used as part of an ongoing quality and compliance programs, and are usually integrated with an automated build processes. 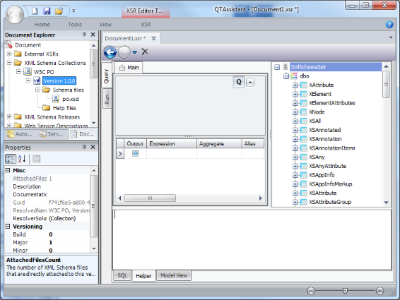 A report item pinpoints the exact line and column position in the XSD file related to analysis item; integrating specific messages providing details about the test condition further helps with the usability of the analysis result. The intent is to reduce the learning curve associated with developing XSD models within large organizations subject to complex conformance profiles. Our team will release in the near future conformance packs, which consist of predefined rule bundles that capture best industry practices, as well as more specific design patterns to help with customizations of industry standard XSDs. 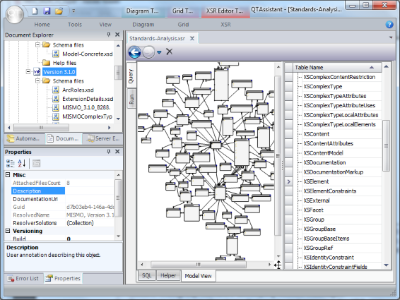 To analyze XSDs, the entire set of XSD files must be valid. We currently support SQL only. 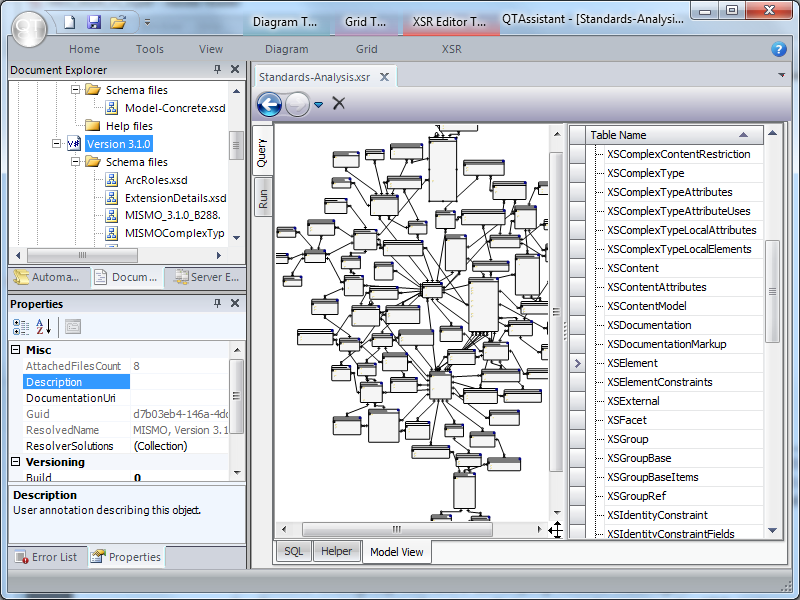 The relational metamodel used to construct the queries is available in the Model View tab of the QXSD designer. 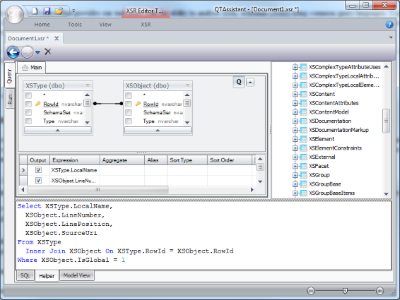 It is similar to the .NET XML Schema API. The object browser on the right can be used to quickly find entities. For illustration we're using the purchase order sample XSD published by W3C with XSD 1.0 Primer (a downloadable file is available here; we've posted a quick overview here). 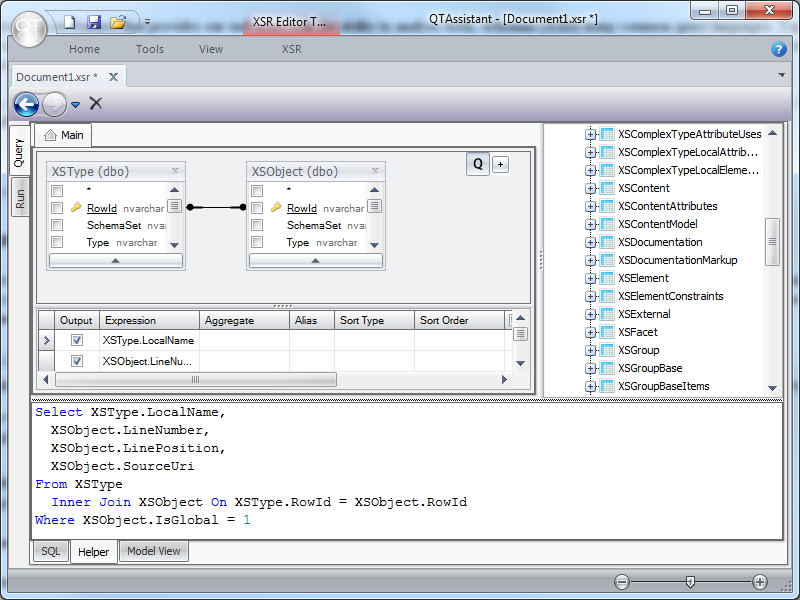 First step is to create an XSR XML Schema Collection object, and attach the po.xsd file to it. 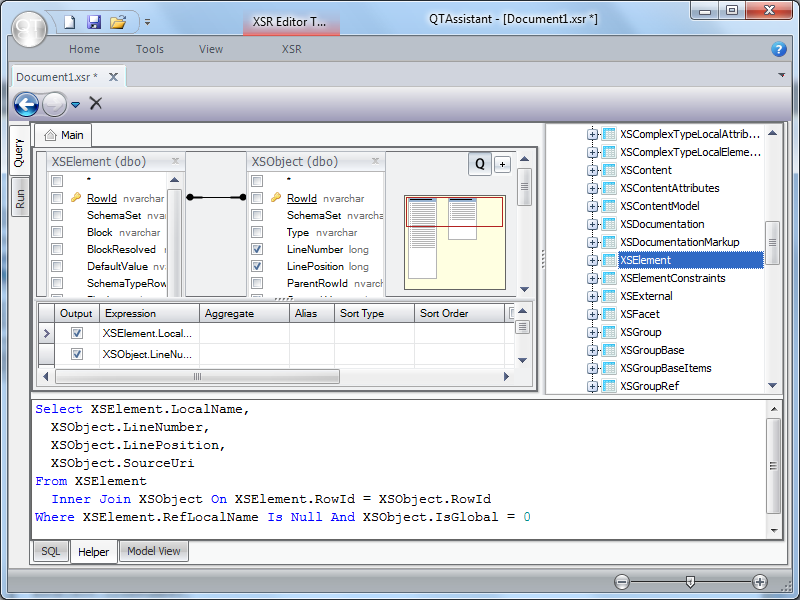 From the context menu on the Version object, invoke the Query XSD Analysis command. 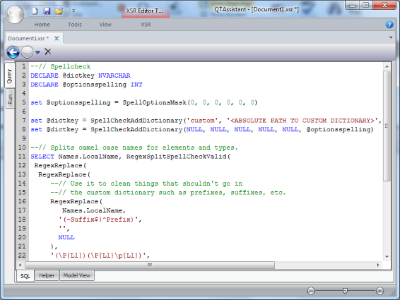 For each of the authoring styles, we provide a list of rules to illustrate analysis examples. The rule sets are not meant to be exhaustive. Locally defined elements are not allowed. The query below finds all locally defined elements; in effect, it produces the list of exceptions to the rule. User defined global types are not allowed. 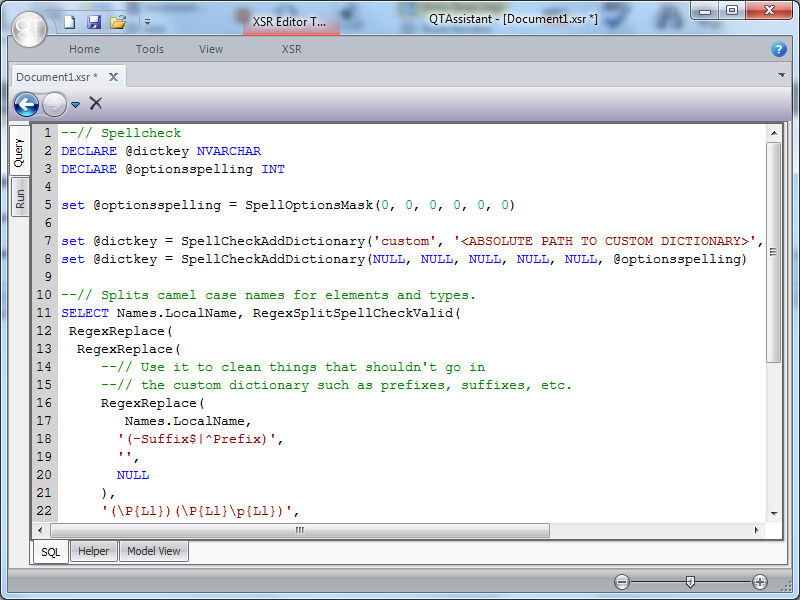 The query below finds all the global types; in effect, it produces the list of exceptions to the rule. Locally defined types are not allowed. The query below finds all the local types; in effect, it produces the list of exceptions to the rule. References to globally defined elements are not allowed. This rule implies that all global elements are "there" to define XML root elements. The query below finds all particle elements that reference a global definition, thus it produces the list of exceptions to the rule. See the same rule under Salami Slice. See the same rule under Venetian Blind. The ability to spell check relies on buit in dictionaries. The user has the ability to override the built in dictionaries, and add a custom one to allow inclusion of specific terms in order to manage false hits. 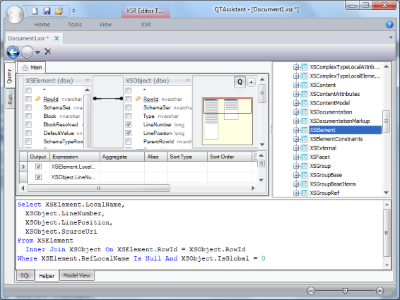 A more complex SQL script, such as the one used in this example, requires the use of the SQL tab. --// Splits camel case names for elements and types. --// the custom dictionary such as prefixes, suffixes, etc. The result set captures in Column1 the offending component and, if applicable, suggestions. By adding SKU to the custom dictionary, the offending line will clear out.